For the stage that is original to Melee, see Kongo Falls. Kongo Jungle in the Smash games. Kongo Jungle (コンゴジャングル, Kongo Jungle) is a stage in Super Smash Bros. (originally spelled Congo Jungle) that reappears in Super Smash Bros. Melee (as Past Stages: Kongo Jungle on the stage select screen and as Kongo Jungle N64 in Random Stage switch), Super Smash Bros. for Wii U (as Kongo Jungle 64 in NTSC versions and Kongo Jungle (64) in PAL versions), and Super Smash Bros. Ultimate. It is one of Donkey Kong's home stages. It is the 6th stage in the 1P Game, where the player, along with two random allies, fight against Giant Donkey Kong. This stage is made up of a main large indented platform. Two slanted soft platforms float over its sides, and in the middle two more small soft platforms spin clockwise in a circle. The main platform can be passed through from below, but not from above. A Barrel Cannon moves back and forth under the stage, spinning. A player who enters the cannon is shot in the direction the cannon is pointing either by pressing a button, or automatically after a while: this can greatly aid recovery, but it can also shoot players offscreen. The barrel can hold only one character at a time. In Super Smash Bros. Melee, the stage itself is a near-exact copy of the SSB version, only being slightly larger. There also seems to be a short delay when the player is launched from the barrel, which makes it riskier to use. In Super Smash Bros. for Wii U, like other returning stages from the first Smash game, some of the textures are slightly higher in quality, but the overall primitive look of the original is retained. In Super Smash Bros. Ultimate, turning stage hazards off will keep the moving platforms in one place and remove the barrel cannon. In Super Smash Bros. for Wii U, the main platform of the Ω form is completely flat. The barrel cannon and soft platforms don't appear, and the main platform cannot be passed through from below. In Super Smash Bros. Ultimate, the Ω form and Battlefield form are similar to SSB4's Ω form; however, they are resized and reshaped to match Final Destination and Battlefield, respectively. The three soft platforms of the Battlefield form somewhat resemble the ones of the normal form. Ω form in Super Smash Bros. for Wii U. 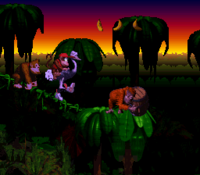 The sunset background as seen in the Orang-utan Gang level from Donkey Kong Country. 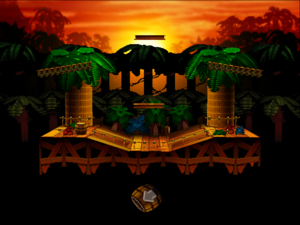 This stage is loosely based on the various jungle themed levels of Donkey Kong Country, such as the ones in Kongo Jungle, and especially resembles the level Orang-utan Gang with its jungle theme and its sunset in the background; however, Orang-utan Gang is set in Vine Valley. In the level Blackout Basement, there are two platforms that oscillate up and down, and in the level Platform Perils, there are platforms with arrows on them that move in the direction the arrow is pointing when the player jumps on them. In this stage, the two platforms that go in a circle seem to be loosely based on the moving platforms in Blackout Basement and Platform Perils. Also from Donkey Kong Country are barrels that the player can get shot out of, either automatically or with the push of a button, that can move in a fixed pattern or rotate in place. Donkey Kong Country 2: Diddy's Kong Quest added arrows to these barrels indicating the direction of fire. In this stage there is a barrel with an arrow that moves from side to side as well as rotate, and players can press the attack button to launch early, or the barrel will fire automatically; however, in Donkey Kong Country 2, the arrow barrels are always stationary. In the background, a flock of Neckies, vulture enemies from Donkey Kong Country, sometimes fly across the horizon. This article or section may be out of date. Kongo Jungle was usually considered to be a counterpick stage in doubles, but is banned in the US national ruleset in singles, as with every other previously legal stage besides Dream Land. The stage's layout does not provide a significant disadvantage for any character, although the slanted structure can worsen certain characters' horizontal combos, such as Yoshi. The Barrel Cannon below may be considered a gimmick, but it is very easy to punish players shooting upwards out of the barrel, and it is also impossible to stall indefinitely in the barrel. However, there were some arguments that circle camping could be a potential problem and that could lead to an eventual ban. It was a rarely played stage, and it was seen the least in tournaments, even if it was more neutral than the one counterpick stage at the time, Peach's Castle. In doubles, though, the stage was much more commonly picked and was generally seen as quite neutral. In the Japanese ruleset, Kongo Jungle has always been banned. However, no definite reason has been given as to why, outside of potential circle camping due to the platforms being too high for certain characters. On this stage, certain palette swaps are banned from being used due to the darkness of the stage's background; namely Captain Falcon's black palette swap, Donkey Kong's black palette swap, and Samus's brown palette swap. Kongo Jungle was usually regarded at first to be a counterpick. Although it had a relatively non-obtrusive stage design, it had a large size, which gave an advantage to faster characters and characters with projectiles, as well as a high ceiling, giving a slightly larger reliance on horizontal finishers. However, the stage is currently banned in singles, since characters such as Peach and Jigglypuff were found to be very powerful on the stage due to the layout allowing easy circle camping. A match between Pink Shinobi and RockCrock at GENESIS is particularly infamous, and commonly regarded as one of the primary reasons why the stage was banned. However, the stage remains a counterpick in doubles due to the 4-character gameplay removing the camping disadvantages, but the stage is seldom picked in tournaments, so much so that it is being phased out of stage selection for doubles tournaments altogether. Kongo Jungle makes an appearance in Smash 4, though unlike in previous titles it seldom sees tournament play, even in doubles. All the notable aspects of the stage are retained, such as the high ceiling but average side blast zones, the platform layout including two moving platforms, and the barrel beneath the stage. However, characters launched from the barrel now have a hitbox, unlike in previous games. The increased range and general ease of ledge grabbing also makes it easier to recover on this stage. Kongo Jungle artwork from Super Smash Bros. 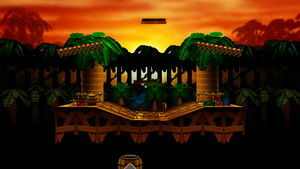 Image of Kongo Jungle in the Challenges mode. The stage in My Music. This stage has had a different name in every appearance. 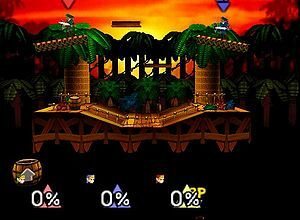 In Super Smash Bros., it is called "Congo Jungle"; in Melee, it is called "Past Stages: Kongo Jungle" on the stage select screen and "Kongo Jungle N64" in the Random Stage switch; in Smash 4, it is called "Kongo Jungle 64" in NTSC versions and "Kongo Jungle (64)" in PAL versions; and in Ultimate it is simply called "Kongo Jungle". In Smash 4, this stage's Spanish name makes no mention of its appearance in the Nintendo 64 game, being named Jungla Kong (Kong Jungle) in PAL versions and Selva Kongo (Kongo Jungle) in NTSC versions without any "64" suffix. 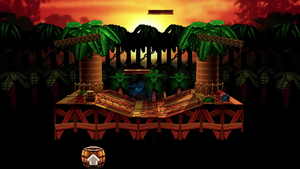 The misspelling "Congo" in this stage's first outing might be due to the fact that two countries in Africa, as well as a river that runs through them, are spelled "Congo", whereas the location in Donkey Kong Country, which this stage's name is attributed to, is actually called "Kongo Jungle", a pun between "Congo" and "Kong". This is the only Smash 64 stage exclusive to Smash Wii U, as it is also the only Smash 64 stage that isn't downloadable content. It is also the only Smash 64 stage in Smash 4 that doesn't have "64" in parentheses (only in the NTSC region). Stages in Super Smash Bros. This page was last edited on April 15, 2019, at 02:08.